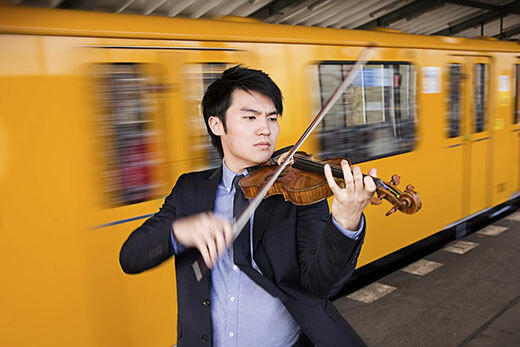 Hear violinist Ray Chen’s exciting interpretations of musical masterworks at his concert on Friday, Jan. 25. Arts events at Emory this spring explore a broad spectrum of creativity, from the innovative use of color in film screenings to duet dance steps, vocal music from a cappella to opera, a theater performance with a comic ghost and much more. The Creative Writing Reading Series continues with readings from new faculty member and author of “An American Marriage,” Tayari Jones, on Tuesday, Feb. 19. Nonfiction writer and poet Eula Biss will give a reading of her work on Wednesday, March 20, at 6:30 p.m. in the Cox Ballroom, followed by a reception and booksigning. The next day, March 21, she will be the featured speaker at a colloquium at 2:30 p.m. in Room N301 of Callaway Memorial Center. On Wednesday, April 3, Jericho Brown will read from his work in the Cox Ballroom at 6:30 p.m. Brown is director of the Creative Writing Program and associate professor of English and creative writing. These readings and the colloquium are free and open to the public. “Duets, Duets, Duets! : Catellier Dance Projects!” kicks off spring dance events on Friday, Feb. 1 and 2, at 7:30 p.m. in the Schwartz Dance Studio with dance duets presented by faculty member Greg Catellier. In “another piece apart,” dance partners Jennifer Nugent and Paul Matteson present their own duet that reflects on a history of fractured togetherness and a shared love of dance, blurring the boundaries between bodies in space. Performances are Saturday, Feb. 23, at 7:30 p.m. and Sunday, Feb. 24, at 2 p.m. in the Schwartz Dance Studio. Ticket prices are $15; $8 for all students. Nugent is on the faculty at Sarah Lawrence College and teaches at Gibney Studios and through Movement Research, both in New York. Matteson is full-time faculty at the University of the Arts in Philadelphia. The spring dance season wraps up with Emory Dance Company’s Spring Concert, presenting new works by student choreographers beginning Thursday, April 25, at 7:30 p.m. in the Schwartz Dance Studio. See the arts calendar for more dates. Tickets are $10; $6 for all students. Emory Cinematheque presents its weekly film series “Glorious Color!” exploring the history of color films on Wednesday nights at 7:30 p.m. in White Hall 208. The series is a collaboration between Emory College and the Department of Film and Media Studies, showing a series of outstanding films from world cinema. The weekly screenings begin Jan. 16 and are free and open to the public. The Atlanta Master Chorale joins the Emory Chamber Music Society on Saturday, Jan. 19, at 8 p.m. for an evening that includes Bach cantatas 9 and 147, Brahms Liebeslieder Waltzes, Whitacre Five Hebrew Love Songs and the Rutter Requiem. Tickets are $35; $10 all students. As part of the Candler Concert Series, violinist Ray Chen headlines a concert on Jan. 25 at 8 p.m.. Tickets are $55; $10 for Emory students. Then the St. Olaf Choir, considered the premier a cappella choir, will perform on Friday, Feb. 1, at 8 p.m. Tickets are $45; $10 all students. Vocalists Eric Owens and Lawrence Brownlee sing a variety of songs from opera to spirituals on Friday, March 22, at 8 p.m. Owens is a bass-baritone and Brownlee is a bel canto tenor. The pair will be accompanied by Myra Huang. Tickets are $60; $10 all students. All of these concerts will be held at Emerson Concert Hall in Schwartz Center for Performing Arts. There will be a carnatic vocal concert by Indian classical singer Prema Bhat. She will perform on Saturday, Jan. 19, at 7:30 p.m. in Cannon Chapel. The concert is free. Jazz Fest 2019 features two events: Jazz singer Vanessa Rubin on Friday, Feb. 8, at 8 p.m. and a Big Band Night on Saturday, Feb. 9, at 8 p.m. Tickets for Rubin’s performance are $20; $5 Emory students. Big Band Night is free but there is a four-ticket limit per order. The Emory Youth Symphony Orchestra, featuring the region’s best young orchestral musicians, performs on Wednesday, May 8, at 8 p.m.. All of these music events take place in Emerson Concert Hall. The Cooke Noontime Series of the Emory Chamber Music Society of Atlanta continues at the Michael C. Carlos Museum through the spring. Check the arts calendar for the Friday noon concerts held monthly. It’s Monsieur Hulot’s birthday and everyone is celebrating… even his ghost! “Tatischeff Café” is a comic pantomime with music, magic and a host of eccentric characters in tribute to the great filmmaker and mime Jacques Tati. Performances run April 4-14 at the Mary Gray Munroe Theater.